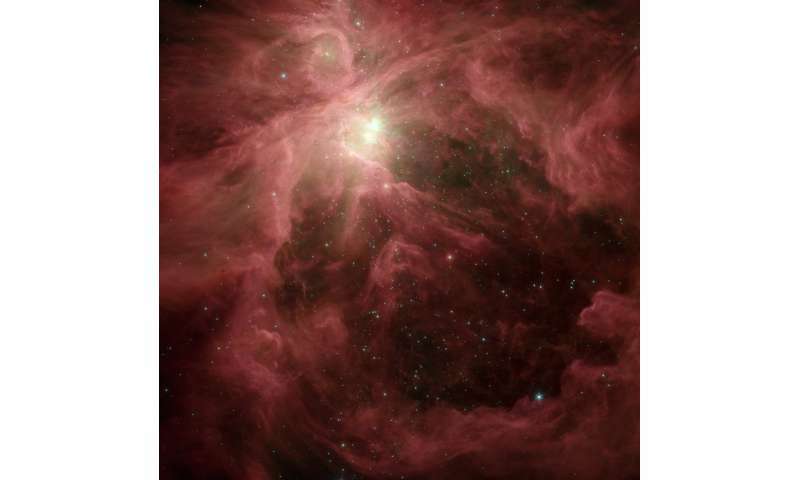 Infrared light from Orion nebula captured by the infrared array camera of Spitzer Space Telescope. The dust heated by starlight emits mainly at wavelengths of 8 and 5.8 microns (red and orange). Credit: NASA/JPL-Caltech. A new study in Physical Review Letters reveals that the series of infrared (IR) band peaks, collectively known as the cosmic unidentified IR emission, arises as a consequence of the wavelike behavior of delocalized electrons in hydrocarbon compounds. An essential aspect of these compounds is that they undergo structural transformations triggered by starlight absorption. These transformations described as defects affect the wave motion of delocalized electrons, that is, electrons that move freely across multiple carbon-carbon bonds in aromatic type hydrocarbons. The study suggests that the spectral characteristics of the cosmic emission are explained integrally by describing the motion of delocalized electrons around structural defects. This outcome offers a physical framework able to account for a full range of observational spectral details in this longstanding scientific issue. A long debated cosmic phenomenon associated with stardust is the universal occurrence of infrared emission peak features, collectively known as Unidentified Infrared Emission (UIE) bands. For decades, this cosmic emission has been explained based on planar polycyclic aromatic hydrocarbon (PAH) molecules floating freely in space. However, increasing evidence supports the idea that it originates in the same stardust amorphous hydrocarbons sampled from meteorites. Yet many questions remain. In particular, researchers wonder what is the average chemical structure of stardust compounds responsible for this phenomenon. Is it possible to explain the observed spectral characteristics based on such structure? 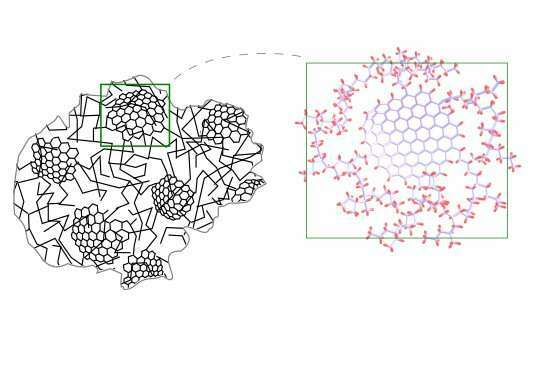 In space, compounds are thought to contain aromatic carbon in the form of fused hexagonal rings, which resemble chicken-wire units. These aromatic units heat up when absorbing starlight, and subsequent cooled by infrared emission at energies corresponding to the frequencies at which the aromatic carbon bonds vibrate. Moreover, starlight absorption can also trigger structural (photochemical) changes in which hexagonal rings adopt other geometries considered as defective rings. The new study based on density functional theory shows that delocalized electron oscillations enhance the vibrations of aromatic carbon bonds. This effect is able to explain the band flux variations of the cosmic emission, and it emerges thanks to the wave nature of electrons. Notably, it is further found that the inclusion of defects in aromatic units influences the delocalized electron wave oscillation in ways that tune emission frequencies into spectral ranges that resemble observed band patterns. For long time, simple planar structures, such as PAHs, have been taken as the origin of the emission but this attribution doesn't provide any understanding on the way these band patterns emerge. Now, because defects are a natural outcome of the starlight processing of dust matter in space, this result offers a coherent physical framework that can account for a full range of spectral pattern characteristics of the cosmic emission as the compounds' chemical structure transforms. This study provides fundamental insight into the chemical structure of the implicated compounds. The delocalized electron wave oscillation (and hence the cosmic emission) strongly depends on the structural edge geometry of aromatic units. This puts stringent constrains on the chemical structure given that the observed bands look rather similar regardless of the type of astrophysical source. To account for this similarity, the study discusses that aromatic units, irrespective of their edges, should exist under confinement by a disordered medium made of saturated hydrocarbon chains (aliphatics), which might cancel out the electronic wave motion at the edge boundaries (due to wave interferences). This provides a compatible mechanism able to explain the observed emission band regularity. As a consequence, this implies that the compounds responsible of the cosmic emission are amorphous structures consisting of a disordered interwoven arrangement of aromatics and aliphatics in agreement with the stardust interpretation. Yah just can't take petrol ANYWHERE in the universe without it getting rambumbtious and causing trouble!